Older toilets are usually larger, so replacing these with newer ones will help save space. New toilet models are sleeker and come in compact sizes. They are also much more efficient, which is an even better reason to use them. Mirrors are some of the oldest tricks used in small bathroom designs. Mirrors reflect light, making the room brighter and eliminating shadows that take away from visual space. Mirrors also create the illusion of more space, whether they are used alone or with other mirrors. When using mirrors in small spaces, try to avoid bulky designs. Do not use mirrors that come with bulky frames because these take up more space than is necessary. Use flat, simple mirrors that are big enough to be functional but unobtrusive enough to help you conserve wall areas. If you prefer, buy mirrors that come with other bathroom necessities such as small shelves or cabinets. Cabinets with mirrors are small enough to fit the space above the sink and functional enough to be used to store toiletries. Mirrors also come in many shapes and sizes. With creativity and a little imagination, it is possible to use more than one mirror in the room to allow optimum light reflection. As functional as they are, however, mirrors can also be too much for a tiny space so use them wisely. Think functionalism when it comes to fixtures. Sinks typically use up space in the bathroom. However, in small bathroom designs, sinks can be chosen carefully to make sure they offer sufficient function and still fit in the room. There are sinks for small bathrooms that are designed to offer both function and style. Sinks for small bathrooms are typically 15%-35% smaller than average ones, so there is some space-saving factor you can take advantage of. Another trick to use is to install sinks for small bathrooms in one area of the room along with other fixtures such as the toilet and the tub or shower. Save floor space further by installing a wall-mounted sink. That way, there will be a few square feet of free area underneath that you can utilize for other things. Downsize other fixtures as well, such as the faucet and the vanity. Choose a faucet with a single control for easier manipulation in a tight area and install a smaller-sized vanity. There will be less room for toiletries and knick-knacks but more space to move. The shower can take up space if you do not choose the style and location well. To make more room for other fixtures, install a corner shower on one end of the area. Some corner showers can even be customized to fit a particular space, while others may be bought at standard sizes. You may also choose to use a shower screen or a sliding door for the shower. These enclosures are typically flat. Using clear or frosted glass can also create the illusion of a window, which helps open up the area visually. Choose one color and stick to it. 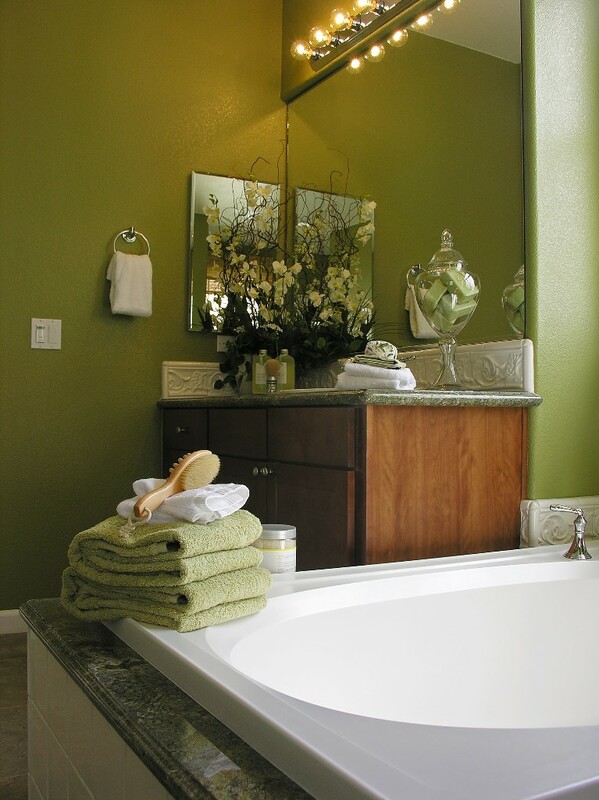 Small bathroom designs often utilize one solid color for walls. Intricate patterns, while interesting, often make the area appear smaller than it is. Use a light and natural shade to give the illusion of an open space. If you must use borders, do so sparingly and avoid bold approaches. If you must use prints, choose light, simple ones. You could also focus on using textures on walls for aesthetic appeal instead of using patterns.